More than 50 delegates from across the nursery supply chain had an opportunity to tour local production nurseries and landscape suppliers on the NGIA wholesale tour ahead of the national conference held in Hobart last month. Tibballs Nursery, Granton Plants, Horticultural and Landscape Supplies and Westland Nurseries opened their doors to conference delegates providing a first-hand insight into their businesses and the broader operating environment in Tasmania. The tours – both wholesale and retail – are an important prelude to the NGIA national conference held every two years and provide a valuable platform for local businesses to share knowledge, showcase innovative practices and discuss issues faced and solved. On this year’s wholesale tour, delegates visited Tibballs Nursery, a third-generation family owned wholesale business established in 1946. The business primarily grows flower and vegetable seedlings, along with a diverse range of edible and ornamental plants. Craig Tibball (pictured below) spoke about the business and its expansion in recent years with the purchase of two new sites at Granton and Brighton. Currently, the business supplies nursery stock to large retailers like Bunnings and to a range of independent garden centres across Tasmania. Craig employs 21 staff and is joined by his son, Brad, who has been working in the business for the past five years and, more recently, his daughter Georgia (pictured below) who began working in the office six months ago. Their involvement will mark four generations of family ownership. 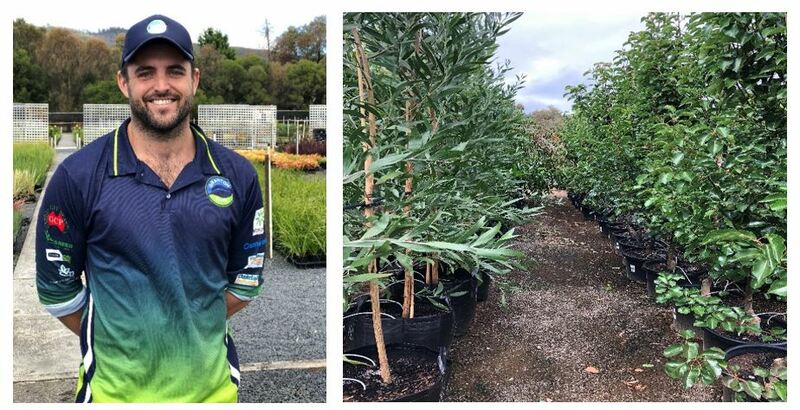 Morning tea was hosted by Joe Kerin (pictured below) and his father and business partner, Damien Kerin, at Granton Plants, a production nursery that’s been in business for more than 30 years, and grows an extensive range of native and exotic grasses, shrubs and trees. In addition to a tour of the production site, Joe outlined the need for the business to remain agile and to move with market demands and changing consumer tastes. He also spoke about the importance of social media and how Granton Plants is utilising Facebook to engage a younger customer base and generate sales through the platform. Next up was Horticultural and Landscape Supplies with a tour of the business’ larger site at Brighton, where it manufactures and packages a range of potting mix, mulch and compost products to the green life sector. The business employs approximately 13 staff and has made a concerted effort to ensure all potting media and mulch meets national standards in order to provide customers with that extra assurance of quality and safety. Owner, Steve (pictured below), said the business has begun manufacturing from new, innovative inputs such as charcoal and seagreens, to help boost the quality of potting mix and deliver a great return on investment for growers. The tour had lunch at the award winning vineyard, Pooley Wines, located in the famous Coal River Valley. Participants enjoyed learning more about the vineyard and, of course, tasting some of its well-known varieties such as Riesling, Pinot Noir and Chardonnay! The final destination on the wholesale tour was Westland Nurseries located on a 30 hectare site at Seven Mile Beach, just 20 minutes from Hobart. The business has been owned and operated by the Van der Staay family since 1956 and offers an extensive range of advanced trees and supplies small shrubs in bulk. Today, the business propagates about 60 per cent of their own stock, supplying wholesale plants and advanced trees to Bunnings, Woolworths, Coles and independent garden centres. Tony Van der Staay together with his son, Mark, (both pictured below) took participants on a tour of the production site which included a look inside the business’ 4000 square metre, fully automated Dutch glasshouse designed for indoor plants. Delegates saw first-hand the automation happening at Westlands such as the ability to control and measure the volume of water being used in their irrigation systems and new technologies improving farm productivity such as a forklift that picks up 120 pots at a time. Thanks again to the expertise and generosity of local businesses, the tours provided a valuable opportunity to share knowledge and take home new or alternative practices to their businesses. For more photos, visit the NGIA National Conference Official Gallery here.